The book has a couple of main sections, each with a slightly different target audience. First, there is a nice introductory section explaining Eurogames and why they differ from such things as Monopoly. For someone new or curious about the hobby – it is an excellent explanation about what we do. 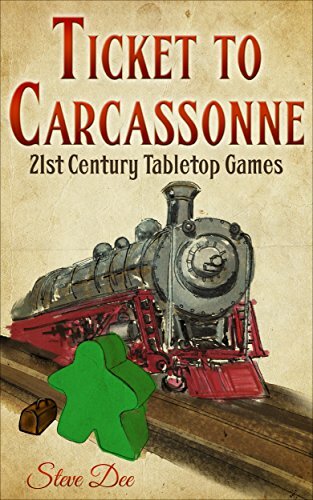 Then, the game goes fairly in depth into five different gateway games – his choices are: Carcassonne, Ticket to Ride, Pandemic, Stone Age, and Dominion – each of which fill a different niche in this worldview of gaming. There is a fair amount of good history included about the backstories of the games, and he has done a good job contacting and interviewing the designers of those games (well, at least when they would answer him). Again, a good resource to someone new to the game. Each of those sections then has a fairly detailed strategy section that goes into fairly excruciating detail on how Mr. Dee plays those games and stomps all over his opponents. Actually, I don’t know that for a fact. Mr. Dee might be awful at games, more like Leicester City FC of 1884-2014 rather than the flash in the pan of the 2015-2016 Foxes. Nevertheless, the strategy offered in these chapters is sound, though I think far above the level of comprehension that the novice gamer (the target of earlier sections) would need. I suppose that the beginner could save this as a reference and then use it to crush his other newbie friends once he introduces them to such gateway games. For most veteran gamers, the five games on offer here are old enough that most of the strategy is either old hat – or, more likely, you’ve moved on to play other shiny new games. Finally, the table of contents tells me that there is some advice on how to host a game night at the end of the book. I haven’t gotten there yet, so I hope that he’s a good party planner. The writing style is easy flowing, self-deprecating, and generally grammatically correct (though it is filled with plenty of parentheticals) — like yours truly. There are plenty of humorous passages, some funny enough to elicit a chortle or two. I’d liken his writing to a mix of Bill Bryson and Dave Barry. You may not know who those writers are, but suffice it to say that it’s an easy read, with humorous areas – mostly due to making fun of himself or his dearest friends – and I’ve enjoyed about 80% of the 70% I have “read” thus far. I’ll admit that after reading the first two strategy sections, I have skipped the other three – but, only at the instruction of the author who told me not to read it if I didn’t want to! But why trust me? For today and tomorrow (that is until Tuesday, 9/13/16), it’s free at Amazon. Go get it yourself and find out. Make sure you get the free Kindle version. The paperback version comes up at $74. With all due respect to Mr. Dee, it’s not worth that amount.